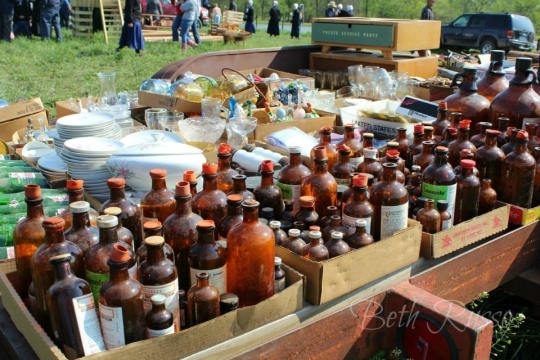 Beth Russo shares photos from the recent Bowling Green, Missouri Amish auction. 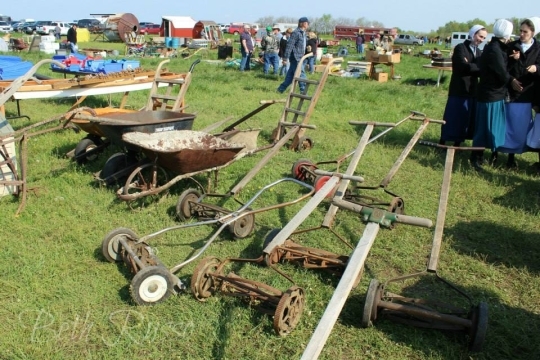 Amish people frequently patronize auctions and sales of one variety or another. These events can have a treasure hunt aspect to them. Estate sales in particular may yield old furniture, books or other heirlooms. Who knows what you might come across. Here are a some of the things Beth came across at Bowling Green. You can see more of Beth’s auction photos here (page moved). 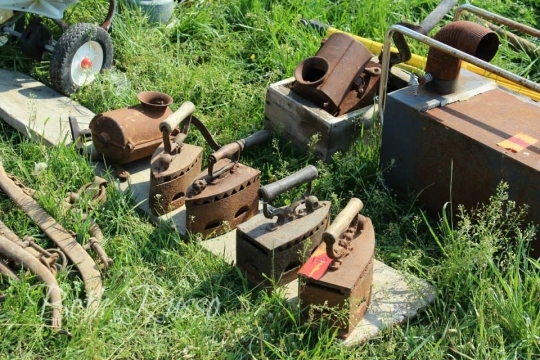 What treasures have you found at auction? Don’t laugh at those lawn mowers. I have one and so do a few other people around here. They are a lot less dangerous on a hill. I have never heard of anyone being killed by their reel mower. Canning jars, canning jars, canning jars! I would certainly buy the sad irons – they iron faster than electric ones. I go to your blog often, but find no new posts. I hope you are well! Your writing has always been a pleasure to read. Peace be with you. Some of my best finds have been a wheelbarrow, big crocks, and a sewing rocker. 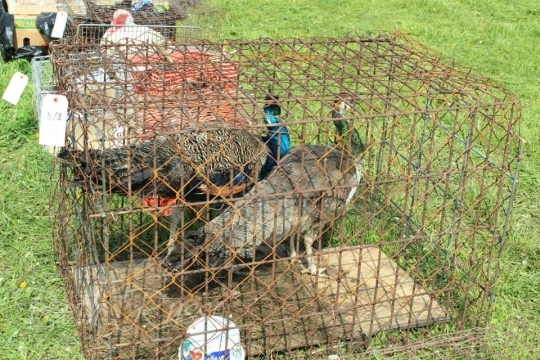 If I had a house in the countryside I would buy peacocks if they were not too expensive. I think they are awesome birds and if you manage to make them breed (and not be expensive fox food) you can sell the young for quite a lot of money and make them into less of an extravagance than they seem at first glance. Feathers can also be sold, but let’s face it, a group of chickens is a more walletfriendly choice. I got a mink coat at an auction in Berlin OH. Took it to the fur shop when I got home to TX. It was worth $3,000. Forgot the most important fact about getting a mink coat at a Berlin OH auction. I paid $12.50 and it was worth $3,000. Wow, very interesting Anita. Though I’m guessing that wasn’t an Amish-owned coat/auction? I would get one of the lawn mowers. When I had my house I always used one of the lawn mowers ever since I was a kid and ran my Dad’s riding mower into a tree. I may be able to drive a car, but not a riding lawn mower. I am safer with the push mowers. When is the auction this year. Have heard the 2nd,9th and 10th of May.Which is it?